Temples provide with the easiest way to connect with God, especially to a person who has embarked on the journey to self realization and spirituality. They provide the much needed imagery to visualize God in a definite form, as well as the perfect ambiance to calm the mind and to connect with one's own self. I've often experienced tranquility and peace of mind by just being in the temple premises. And my favourite time of the day for a Darshan is the evening - the evening Arati and chanting of Mantras never fails to uplift my spirits. The walk back to home after the evening Darshan, as the day slowly turns into night, is one of the most relaxing and fulfilling experiences of my life. I have had the good fortune of offering my oblations at many sacred altars - right from the humble village temple at my birth place to such holy places like Guruvayoor, Ayodhya, Kashi, Gokarna, Mookambika and Palani among others. Curiously, I found that the temples of Kerala were exuding more spiritual vibrations than any other... I have often found that it is easier to connect to the sense of devotion (Bhakti) and oneness with the Supreme Power here than in any other place. Or should I say that it is easier to channelize the devotion that naturally overflows in one's being in the temples of Kerala? Of late, as the politics of religion has changed, much has changed about temples too. What earlier was a medium of communication with one's own self and the Supreme Self, has - sadly - been transformed into money collection centres. The commercialization of temples is a painful reality of today. 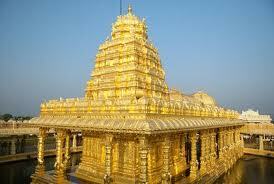 A few days ago, I had an opportunity to visit the Golden Temple of Sripuram in Vellore. I had heard so much about the temple in the past few years that when I got a chance to visit the temple, I went happily. I went there with an open mind, with no presumptions at all. What I saw there was a grand display of wealth and self promotion of the founder of the temple. At every nook and corner, the pictures of the Godman (he is called Sri Sakti Amma - as he is believed to be a personification of Goddess Narayani) in Abhaya Mudra (gesture of blessing) could be found. It was shocking (at least for me) to see his photo in the Sanctum Sanctorum too. Of course, Gurus are an essential part of spiritual growth. But they act as the lighthouse leading one onto the right path. What I saw in this particular case (in a short time period of a couple of hours) was unabashed promotion of the swami. It was also the costliest Darshan I ever had in my life in terms of money. Each ticket cost Rs. 250/- for a Darshan with out too much of queue and which allows one darshan from a point closer to the Sanctum Sanctorum. (I later learned that in temples like Tirupati the rates are much higher for a similar darshan) An added bonus is that a prasada kit - a colourful bag depicting the photo of swami - is given 'free' to such ticket holders. The kit contains some vibhuti, a sweet, a thread to be tied on the wrist, a photo of the presiding deity (invariably, the swami is standing right next to her) and a booklet on the history of swami and the temple. Some VIPs were given preferential treatment and special Arati was performed for them. We reached near the Sanctum Sanctorum and sat down for a couple of minutes in a group of twenty or so while some rituals were performed. Then, the volunteer asked the Rs. 250/- ticket holders to go out as the value for their money had been realized. A few remained for further poojas. I presumed that they had paid more and were eligible to attend more rituals. On the way back to the exit, we had to pass through several counters that sold merchandise like CDs, Books, Photos, sarees and what not. I could see they were not leaving any stone unturned when it comes to marketing their products... Moreover, even in the base of the fountains, one could find heaps of coins lying in water. At last at the very end of the star shaped path I found out one good aspect of the whole system. Free Prasada for all - in a dried leaf bowl. It was something akin to upma (tasted real good too). Apart from that I could not see even a drop of water being offered free of cost there (of course, I might have missed noticing it). All in all, it left a bad taste in my mind...Many questions came to my mind... Most are still unanswered. Money seems to be the only factor that counts everywhere. Sadly, even God is being dragged into this vicious circle. What once used to be holy and uplifting experience, now seems to be sacrilegious!!! Disclaimer: This post is not intended to discredit or hurt anyone. I have not done a study of the social works (if any) carried out by the temple trust or the swami.This has been written as an observation as to how things have changed and not to malign anyone or any religious sentiments. Share your sentiments. I still prefer going to those small temples with no dewaswams. All those larger temples; I visit them for the architecture rather than Bhakthi. a truly sad state of affairs... to say the least! Thank You very much Leo! Bhakti is commercialized... These days, I should admit that my belief in God is lowering as people are following all idiotic customs saying that God asked to do so! If there is God who is supposed to be the protector of all human beings without discrimination, there should not be rituals hurting others. Yes, Commercialization is stealing the holiness out of it. Doesn't mean that we have to lose our belief...Rituals are man-made, There might have been a reason for their existence; but as you said, it shouldn't be to hurt anyone.. These days most of the temples have become a place to make money, promote menGod and promote party politics. People have ruined it to an extend that I don't find the simplicity and tranquility to sooth a devotee like me. Very true Leo! It is sad that even temples are becoming unapproachable these days!!! Dr. Roshan, Hearty Welcome to Random Thoughts!!! And I agree with you and Leo that the temples have become more like business centres than abode of the God. Even I felt that it was a blatant self-promotion which I witnessed there. That feeling prompted me to write the above blog. Thanks for sharing your thoughts and hope to hear from you again! It is true that rituals became more dominant than the true worship. It surely is an easier mode to augment the revenue. In thekkan mookabi temple at Paravoor the vidyarabha ritual is hundred times bigger an incident than it was years back.okay no comments. but now they have displayed a menu card type big board on the wall with numerous new offerings to the deity(vazhipaadu), which were not prevailing some years back. Saraswathy being the goddess of knowledge, there is a heavy rush during the examination season.Taking advantage of the crowd, temple authorities added special items in the menu like "sreevidya manthram, thattam nivedyam,etc. etc. which we have not heard of in our childhood days. We need not be surprised even if they introduce newer ones like SSLC Malyam,Entrance Vijayeemanthram, UPSC NIvedyam IAS Poosparchana, to cater the demand of the customers.!! most of our temples became good business firm; they are selling bhakthi.